Started ordering switches and other electronic components. I have found the DigiKey online catalog the easiest to navigate when hunting for parts by function and feature, rather than part number. I also started downloading and printing over 1100 pages of Garmin installation and operations manuals. Received a first quote for the G3x system from Stein Bruch, whose company SteinAir is highly recommended on the RV users forums. Over the next seven days Stein prepared five quotes for several different combinations of instruments and services. I placed the G3X order on the 24th. 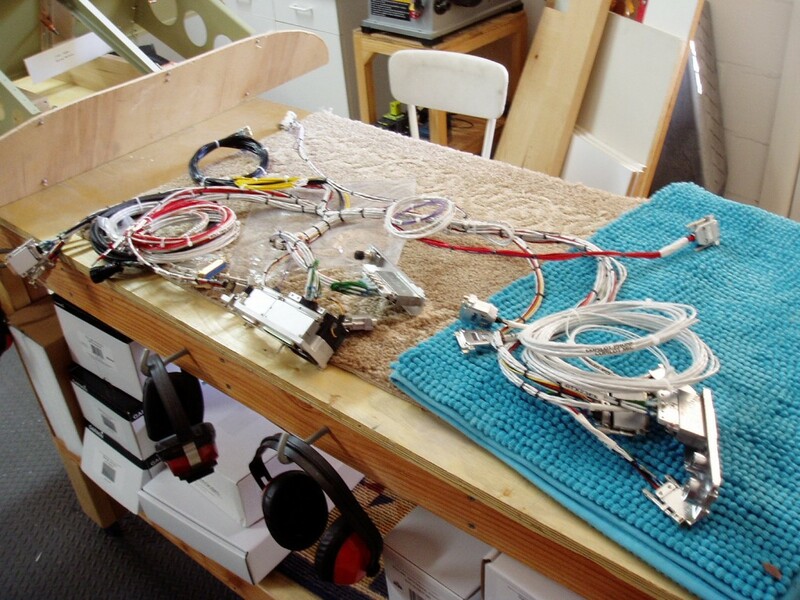 It included the wiring harness and as-built drawings for the system. 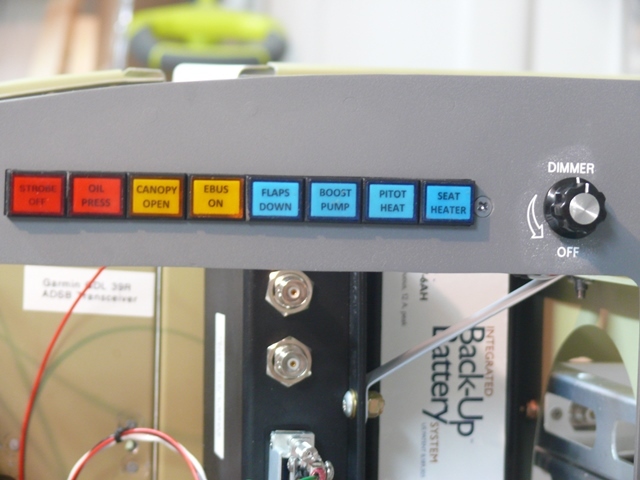 A VPX-Pro circuit control box had been purchased from Aircraft Spruce at the Sun-N-Fun airshow in March. I will do all of the switch and power distribution wiring for the panel. Astronics maintains excellent circuit planning and load balancing software online. I started populating the circuit planner, and the making of PowerPoint circuit diagrams for the panel switches. Prior to this I had made an Excel workbook with sheets for electrical component functions, panel switches, joystick switch functions, annunciator panel lights, and expenses. 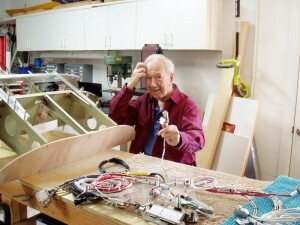 Doyle, one of the SteinAir techs, asked how the G3X components were to be laid out so he could plan the wiring harness. 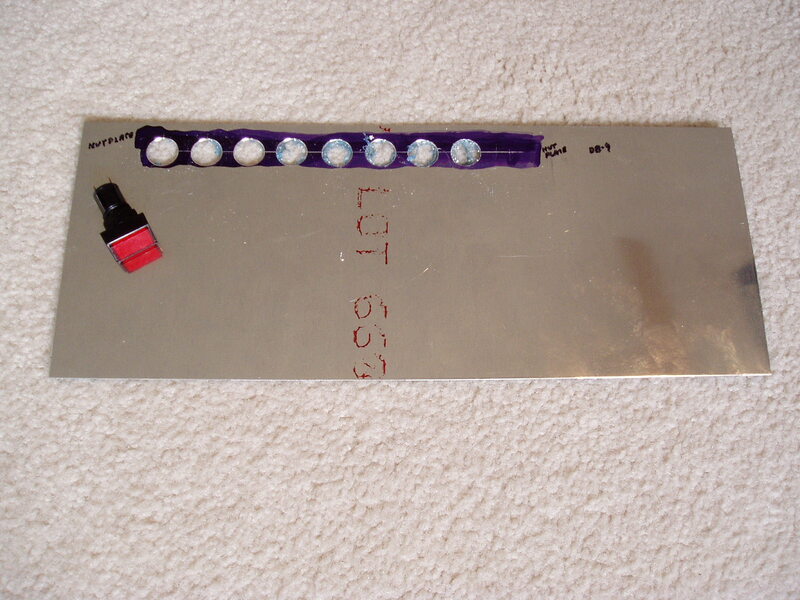 I sent him this photo of components taped to the sub-panel. The final locations were somewhat different but the harness lengths worked out just fine. 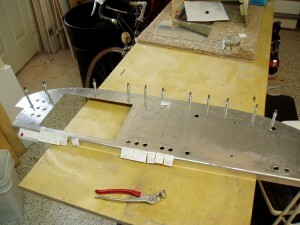 The two loose rib sections had previously extended aft from the sub panel to the main panel. They were cut off because they would have interfered with the location of Garmin’s 10 inch PFD and MFD screens. 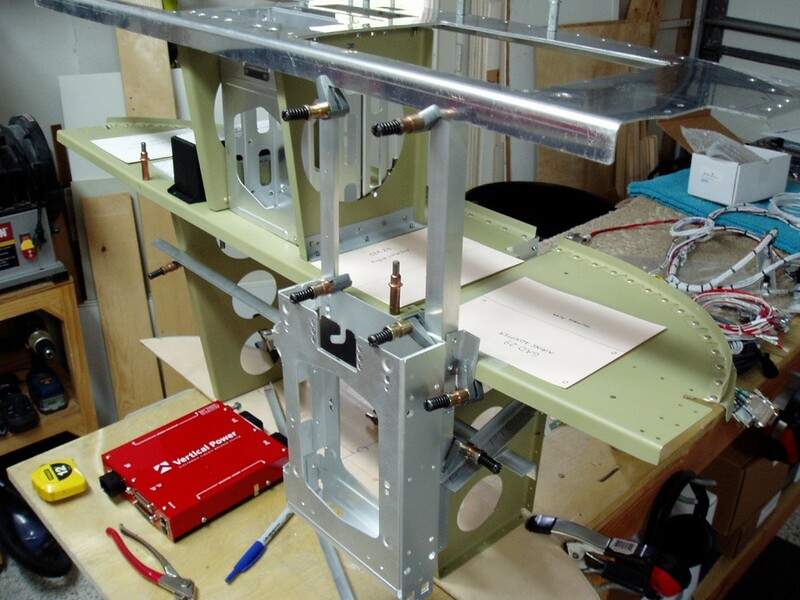 The ribs were riveted onto aluminum angles and re-attached to the sub-panel on each side of the center radio stack. 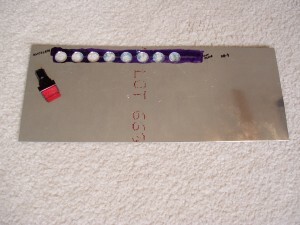 A previous post has described the construction of two prototype twelve-light annunciator panels. With lengthy deliberation the desired number of lights was whittled down to eight. A paper mockup preceded layout on aluminum sheet, followed by cutting and folding into a box structure. 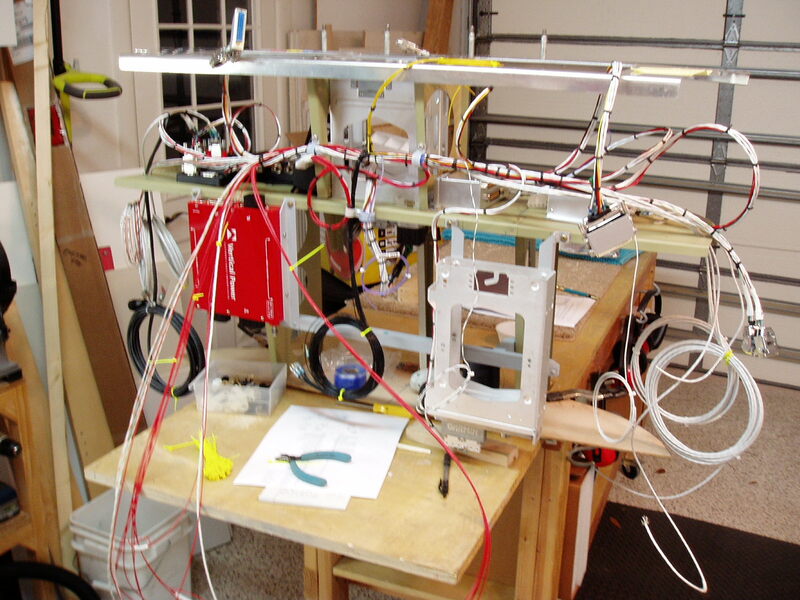 The wiring is much simpler than the prototypes. A printed circuit board was not required. The annunciator panel was finished on December 15th. 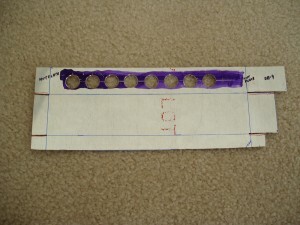 I laid out the drill and cut lines for switches and instruments on the main panel. 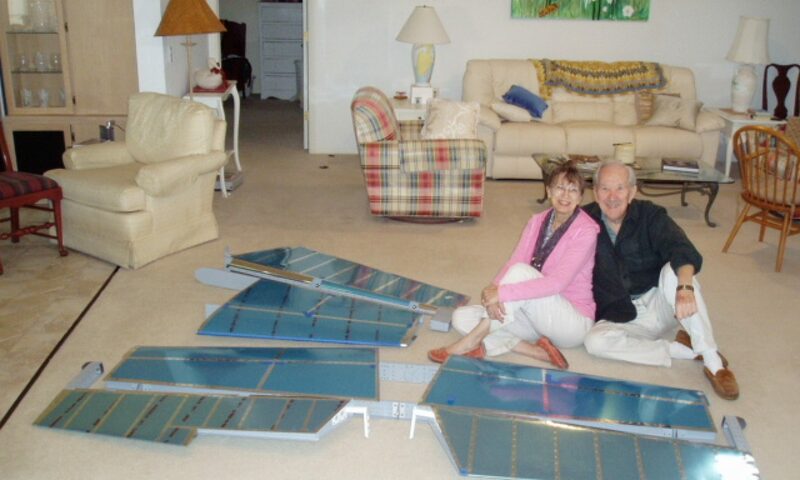 I wanted to have the panel ready to receive components when they arrived from SteinAir. The Garmin components had arrived at SteinAir by the 21st but the holidays would delay starting the harness until after the first of the year. 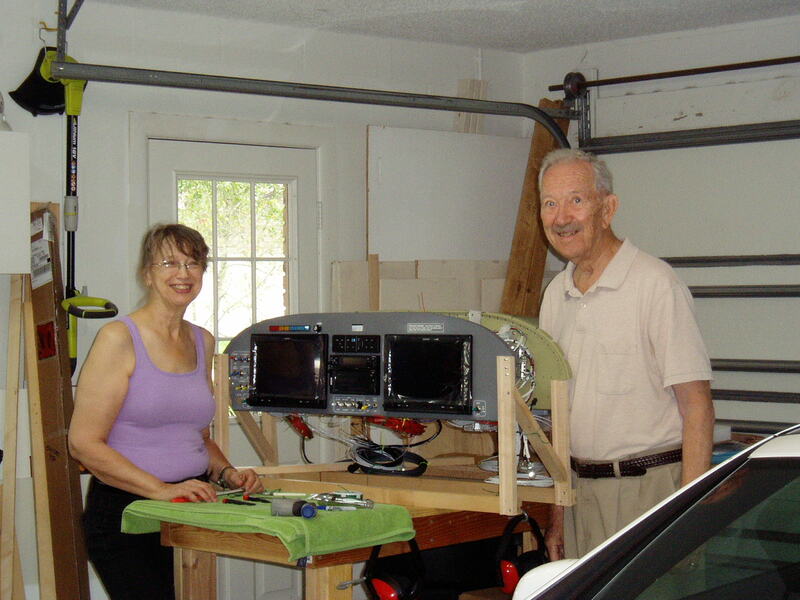 Flew the Swift to Lakeland and purchased an ACK E-04 ELT beacon from Gulf Coast Avionics. 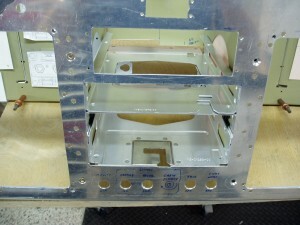 Four days later the slot for mounting the ELT control head was ready in the top center of the Panel. 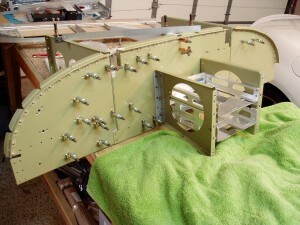 The RV-7 tip-up panel has a hole in the upper center for the shaft of a canopy release pull handle. I intend a redesign of the release mechanism, as other have done, to place the handle in an accessible spot behind the main panel. The ELT control head slot was located so as to subsume the hole. While waiting for the shipment from Stein, I used PowerPoint to draw switch labels. 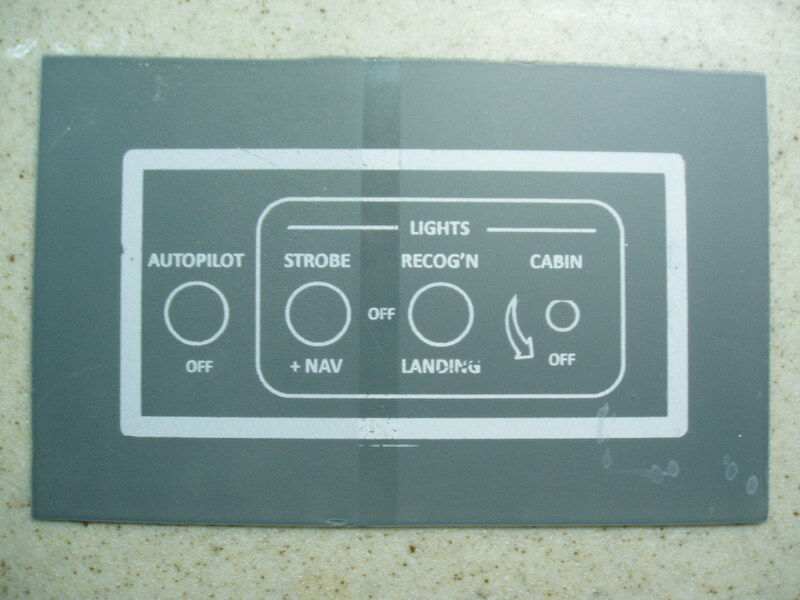 Hoping to do the panel painting and labeling myself, I purchased the DecalPro Kit and a quality Apache laminator. Test labels came out great. More on this later. I was at the Light Sport Expo in Sebring when the Garmin boxes arrived. The wiring harness were impressive, well made, nicely laced, color coded with heat shrink labels. And, were initially very confusing. The Garmin displays come with a backing frame that is riveted to the back side of the panel and has rivnuts into which the display mounting screws are threaded. 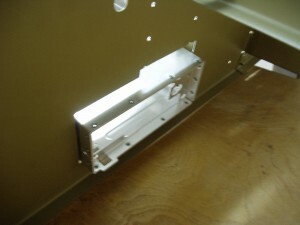 These were installed after filing the panel openings to final size. By the 24th all panel openings had been sized and the short ribs (see 11/25/15) riveted to the sub panel. 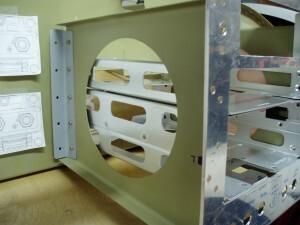 Vertical rails were fitted to the sides of the radio stack trays. The Garmin trays are dimpled outward to accept flat head #6 screws. The rails were then riveted to the back of the main panel. 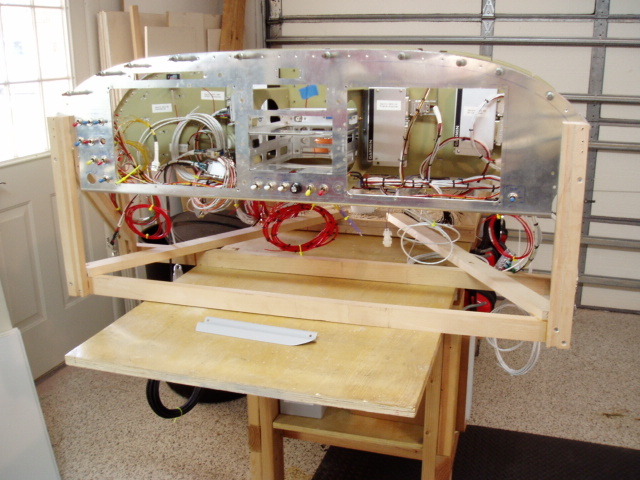 The instrument trays were next removed and the panel temporarily mounted to the ribs extending from the sub-panel. 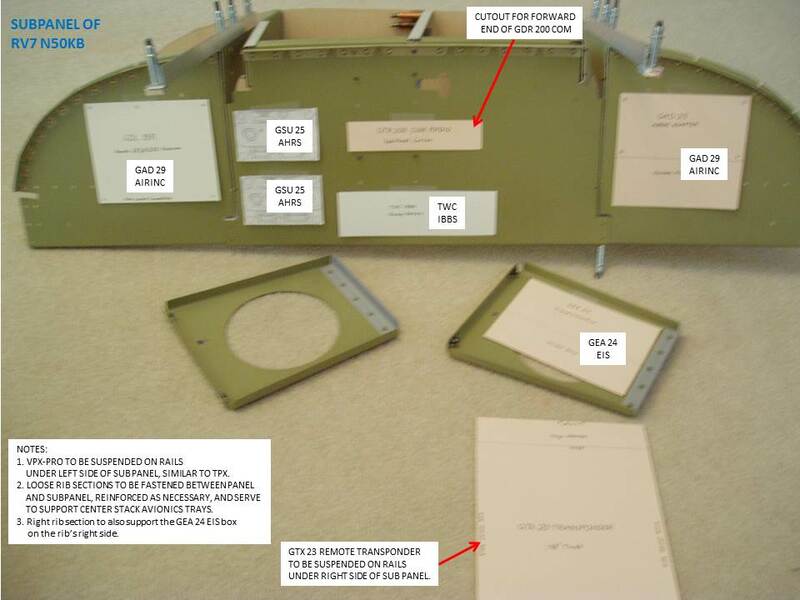 The radio trays were slid into their front panel openings and the sub-panel marked for cutouts to accept the rear of the radio stack. I had chosen a remote mounted transponder for the G3X package. 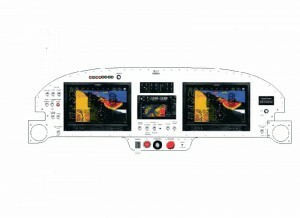 Transponder code settings can be done from either of the GDU 460 display screens. 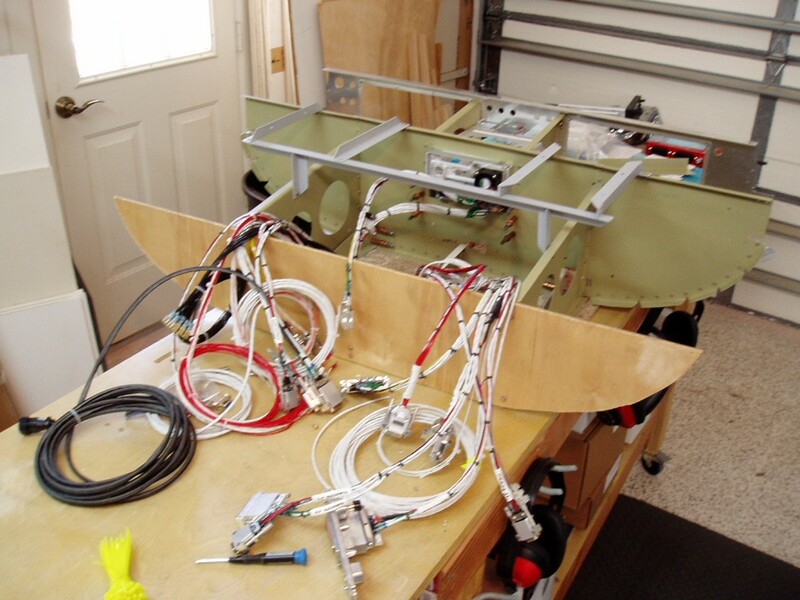 Both the GTX 23 ES transponder and the VPX circuit controller were to be mounted above Dolly and my legs and below the panel structure. 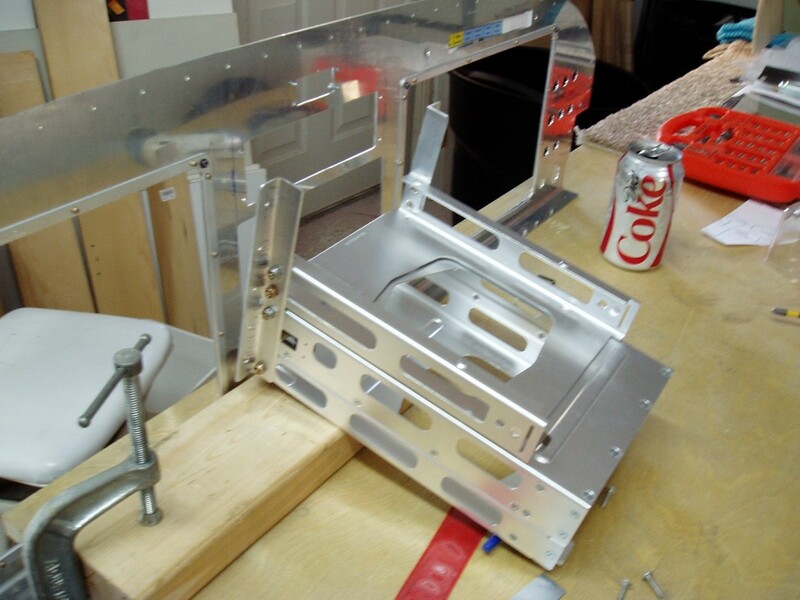 The following photo shows the mounting frame that was riveted together and bolted to the sub-panel and ribs. At this point, the harness is connected to the structure only at the rear of the radio and navigator trays. The aft ends of these trays arrived as part of the harness, and once connected to the sides of the trays can be removed, but …. Stein emphasized that most failures occur inside the black boxes, not in the wiring harnesses. 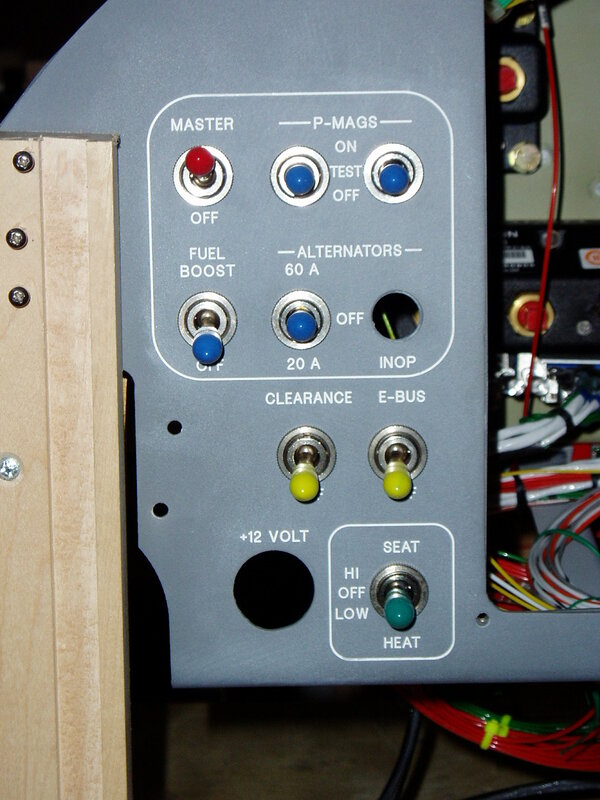 This helped with the decision to locate the harness backbone below the panel, leaving more open access to the boxed components from the top and front of the panel. Pulled the panel apart again! 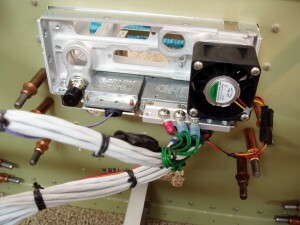 The time had come to make a commitment to the exact location of each component on the sub panel, considering not just the size of each box (Garmin calls them LRUs, local resource units) but also their connectors and wiring. 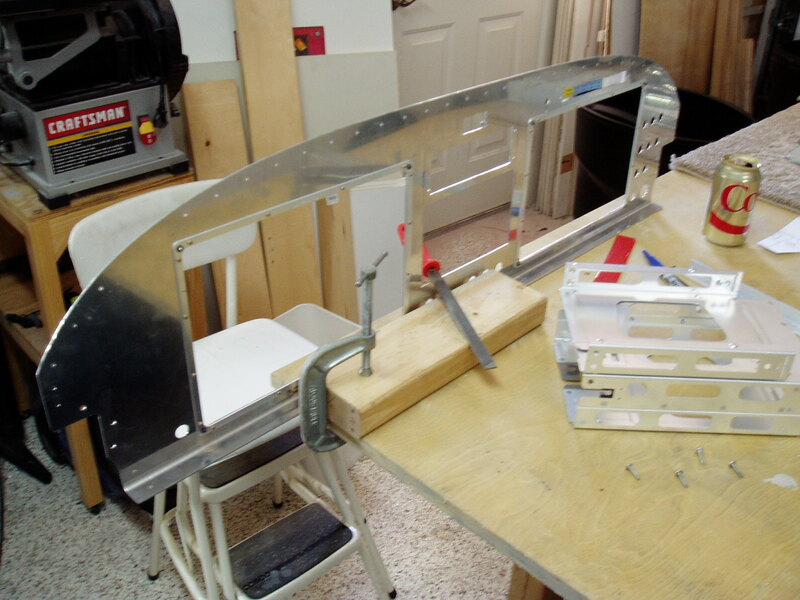 I made good guesses and started drilling holes and flush riveting nutplates on the forward side. The red VPX box has been permantly mounted in the photo below. Some of the LRUs were temporarily mounted to the sub-panel and attention returned to distribution of wires. The harness is in a tee shape with arms stretching from left to right, and a centered trunk going forward. Blue silicone stretch tape wrapped around the wire bundle protects from chafing on the nylon clamps that fasten the harness to the structure. I worked up a bill of materials for switch wiring. It lead to an order of ~300 feet of new wire from Steinair. Waiting for the wire, I built a DB-9 connector harness for the warning lights. The LEDs require only 20 milliamps at full brightness. 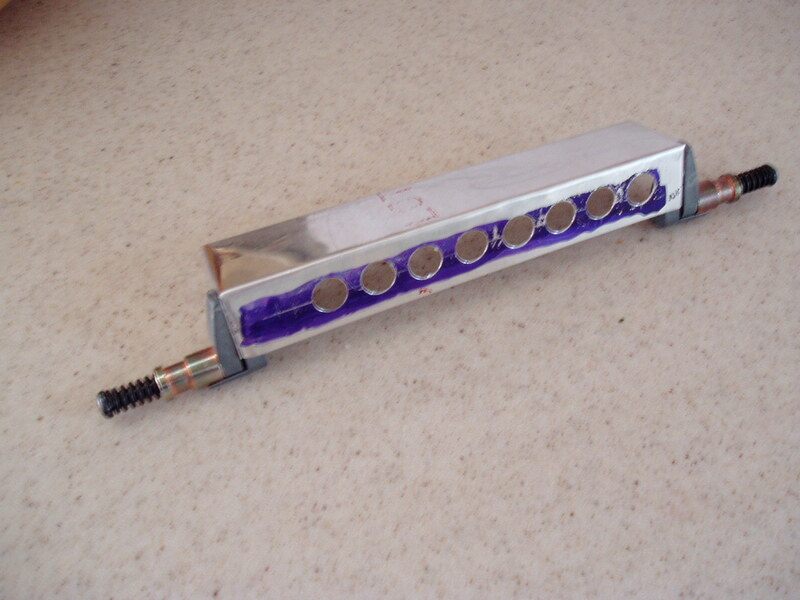 The lights come with built in current limiting resistors. 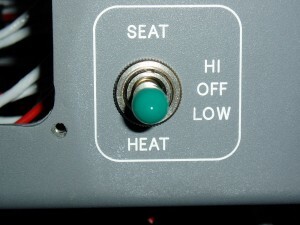 The LEDs light when a switch or sensor grounds their cathode. 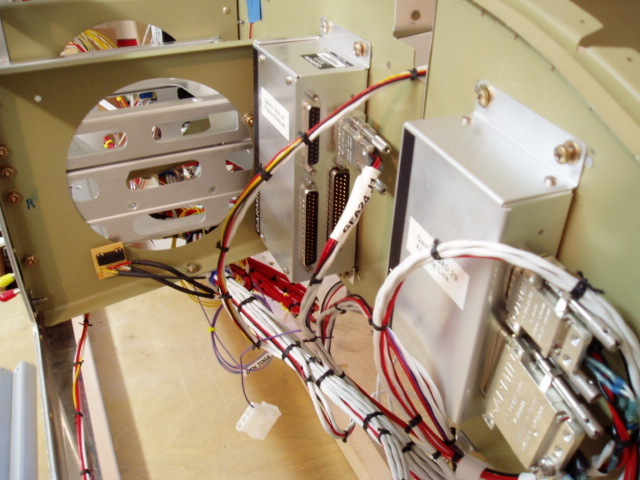 To have the “strobe off” annunciator circuit work, I mounted a normally closed reed relay on a small circuit board mounted at left center in the photo above. The VPX -Pro box has five connectors; two are low current switch inputs in DB connector format, and three are higher current plugs. Assignment of wires to plugs is done using the VPX online planning software where electric function and current requirements are set. I found it useful to segregate SteinAir’s harness wires according to VPX plug before adding my switch wires and additional harness lacing. Stein’s color coding sets red wires as power, black as ground, and other solid or multi-colors for signals. All shielded multi-wire cables are white. I continued with red for power, yet used white for grounds. 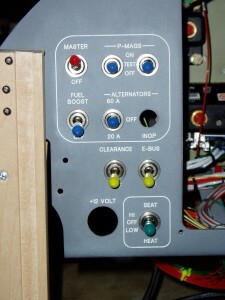 When wires were added for the switches and VPX box, they were labeled at each end. The labels indicate where the other end of the wire is fastened. 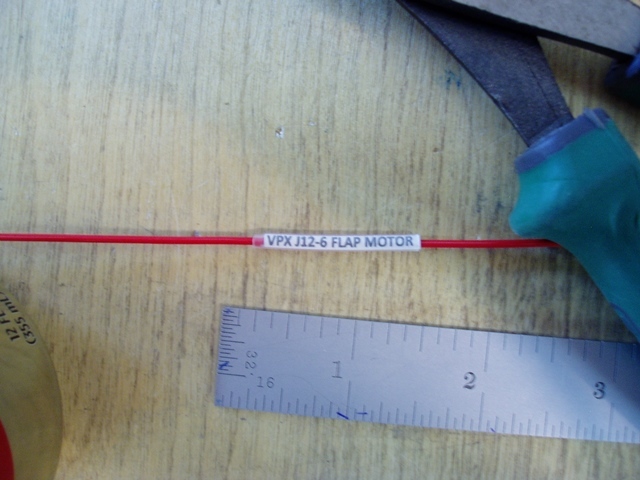 Labels were printed in Microsoft Word 6 point type and slipped under 1/8″ diameter clear heat shrink tubes. Sixteen feet of clear tube labels were applied. The three power connector plugs for the VPX box use square cross section pins that require a special tool for crimping to wires. 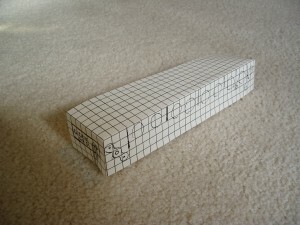 I sent Chad Jensen of Astronics an email with a photo of their box on the partially completed panel. He mailed a crimper that had been returned from France. Chad only asked that I return it within 30 days. Great customer service! The tool purchase price is $200+. With new wires running everywhere, the under panel area took on the spaghetti bowl look. 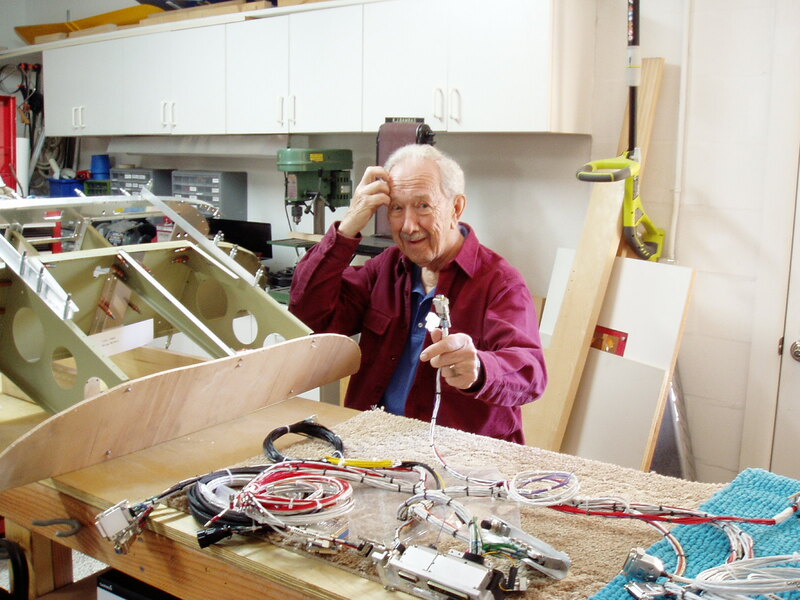 Like everything else in building an RV, it’s just one rivet, one part, one wire at a time. Printouts of the VPX planner pinout diagrams were invaluable. 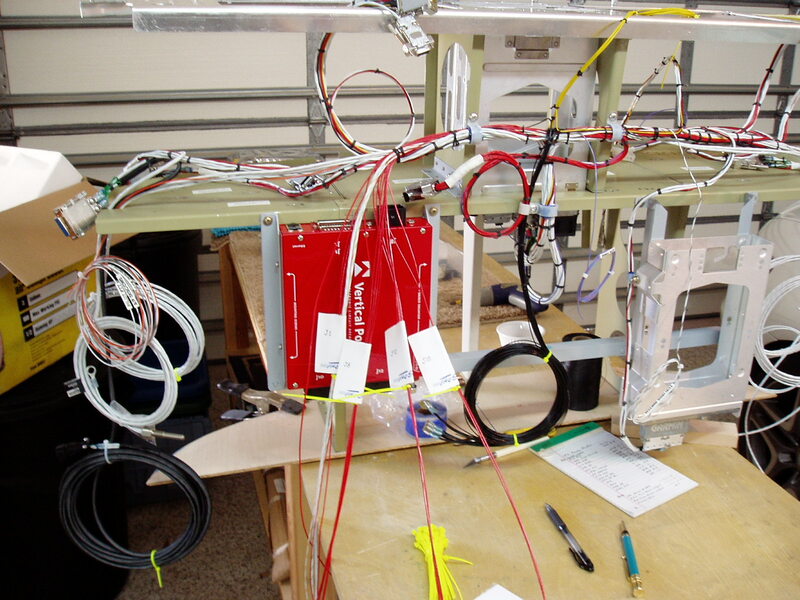 By the 27th, wiring of the VPX box was complete. 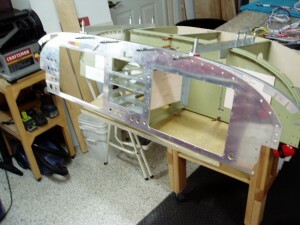 We need to transport this winter’s creation to Michigan for mating with the RV-7 fuselage. To this end I screwed and glued a frame that will fit into the rear of Dolly’s Chevy HHR. There is still plenty of wiring to do, reaching out to sutopilot servos, wing lights, flap and trim motors, set heaters and phone jacks, engine compartment, boost pump, etc. 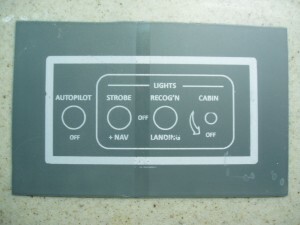 The switches were removed and the front panel dismounted for painting and labeling. While the DecalPro process can make great transfer labels, I found the process extremely frustrating. I ScotchBright scrubbed and washed the panel and gave it a smooth spray finish in rattle can smoke grey. The first label applied would be just fine. But, some time before all the labels were applied one would be set slightly off kilter. I painted and stripped the panel three times before having it powder coated at a shop in Tampa. I had hoped to test fire the panel while still in Florida, and knew that antennae would be required to protect the transmitter circuits. Internet searches surprised me in that Aircraft Spruce had the lowest delivered cost for a bundle of four. I ordered these and 34′ of RG-400 coax. Now I’ve decided to wait until later in the build to light up the panel. When the coax arrived, I found it very easy to assemble necessary TNC and BNC terminal ends. Waited for the panel to have labels engraved. The GDL 39 could not be mounted flat to the sub-panel as originally planned due to potential interference with the tip-up canopy hinge. It was re-positioned to be held with one side edge to the panel and the opposite edge supported by braces to the left side radio stack rib. Following are some photos of the labels. I LOVE the pics and I LOVE bambas.com and I LOVE YOU! I am thinking of g3x for my rv7. Any tips / gotchas / info you can share ? I amay still designing on paper and getting a bill of quantities together before ordering. In the UK where I amust located the requirements are more onerous for ifr. I started to write you a list of all the decisions I had to make in selecting and assembling the panel, and it was unending. Only advice: plan, plan and do some more planning before cutting metal. As I have yet to put power to the panel, I don’t consider myself to be the best source of advice. Good luck. I have decided on Garmin for my 7 slider. I had my panel precut by Stein and bought the interconnect drawings. Did Stein do your harness? I was considering building my own harness, but like the thought of having them build one for me, though I’m using CB’ and not a VPX. For your switches, rheostates, wire, etc, did you go through digikey? I’m about to pull the trigger. Yes, Stein built most of my harness. 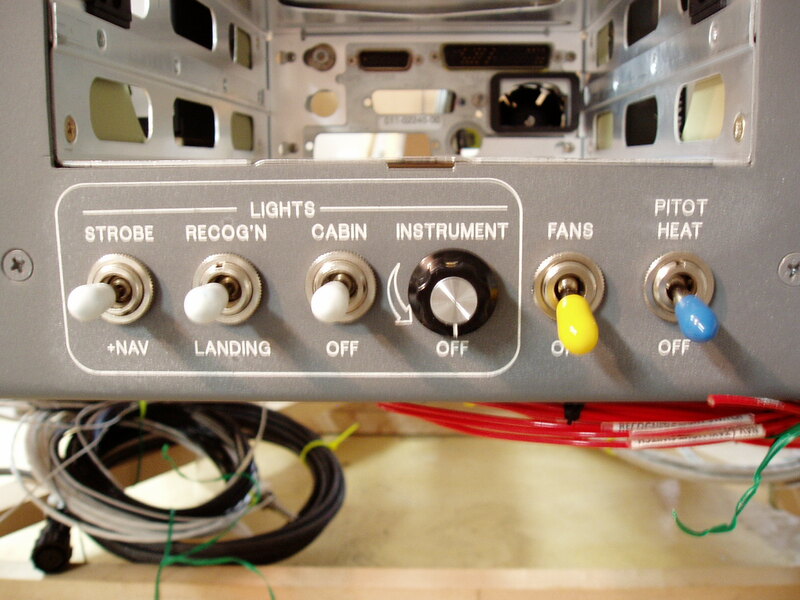 I did all of the power wiring from the VPX plus the wiring for switches, lighting, etc. 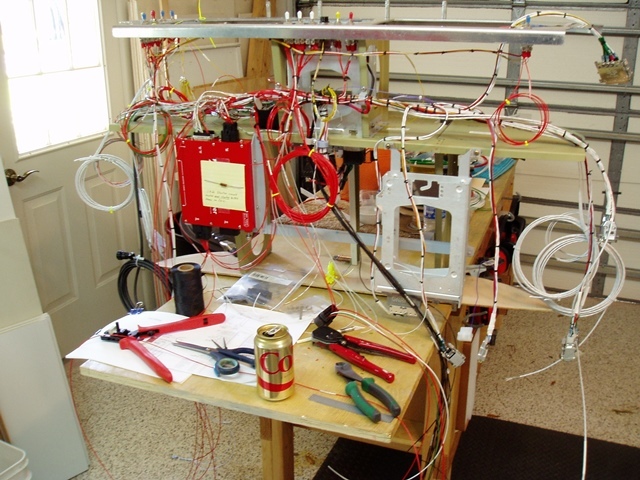 If you have the harness built for you, I suggest you know pretty closely where each LRU will be located so the harness wire lengths will be what you need. I used some electrical components from Digikey and some from Mouser. Good fortune with the build.